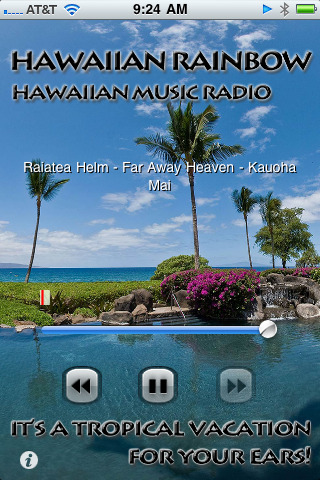 Hawaii : Hawaiian Music Radio - Listen to Hawaiian Music online. It's free. Hawaiian Music Radio Station Streaming Online 24 hours a day. Plus: A FREE download of A Secret Beach CD with any donation. Listen to a sample (mp3) A nature sounds CD... no voices or music. Buy a plate lunch for Rich (Donate $10). Donate enough to buy a CD for HawaiianRainbow (Donate $16). Donate enough to buy a CD for HawaiianRainbow and a plate lunch for Rich (Donate $25). Donate enough to buy 2 CDs for HawaiianRainbow (Donate $32). Make up your own one time donation to HawaiianRainbow. You can unsubscribe from monthly donations at any time by clicking this button. ** PLEASE, NO WESTERN UNION MONEY ORDERS!! ** Please include your email address so I can send you the Secret Beach download link. HawaiianRainbow.com is not a music download site. Any recording, ripping or copying of the music played on this radio station is illegal. Please respect the Hawaiian artists and purchase their music if you like it. Directory of over 4000 Hawaii websites!